In email, you can mark emails as read. In Google Reader, you can mark posts as read. Why can’t we mark tweets as read? Why can’t we mark Facebook posts as read? I can understand why we can’t do this in Facebook. The developers of Facebook control the interface completely, so they must want us to read posts repeatedly. But with Twitter, there are a plethora of different reading apps. Certainly there should be one that can mark tweets as read. 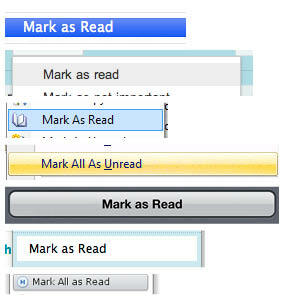 Email and Google Reader allow you to mark things as read because it’s efficient. You can burn through a list of items and never have to look at them again. But Twitter and Facebook don’t let you. Is it because they want you to waste time looking at something repeatedly? There are so many posts on Facebook and hundreds times more tweets on twitter. Those are the very things we should be able to mark as read and have them disappear from our regular feed. There might be som twitter tools out there that do “mark as read.” I’ve tried hootsuite and tweetdeck.